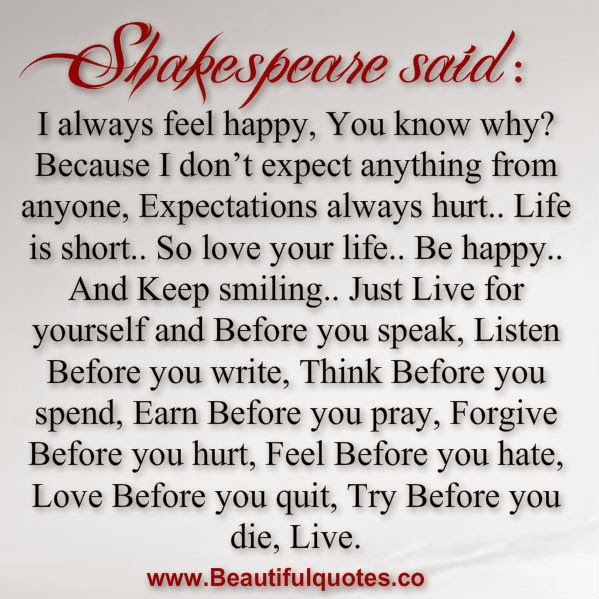 Shakespeare said: I always feel happy, You know why? Because I don’t expect anything from anyone, Expectations always hurt.. Life is short.. So love your life.. Be happy.. And Keep smiling.. Just Live for yourself and Before you speak, Listen Before you write, Think Before you spend, Earn Before you pray, Forgive Before you hurt, Feel Before you hate, Love Before you quit, Try Before you die, Live…… That’s Life…Feel it, Live it Love it & Enjoy it.